Dallas Personal Trainer - A fantastic exercise for strengthening the arms, lats, rhomboids, and the entire upper shoulder girdle while teaching the shoulders to pull down and back. Rarely do Dallas personal trainers utilize this gem of an exercise for their clients. 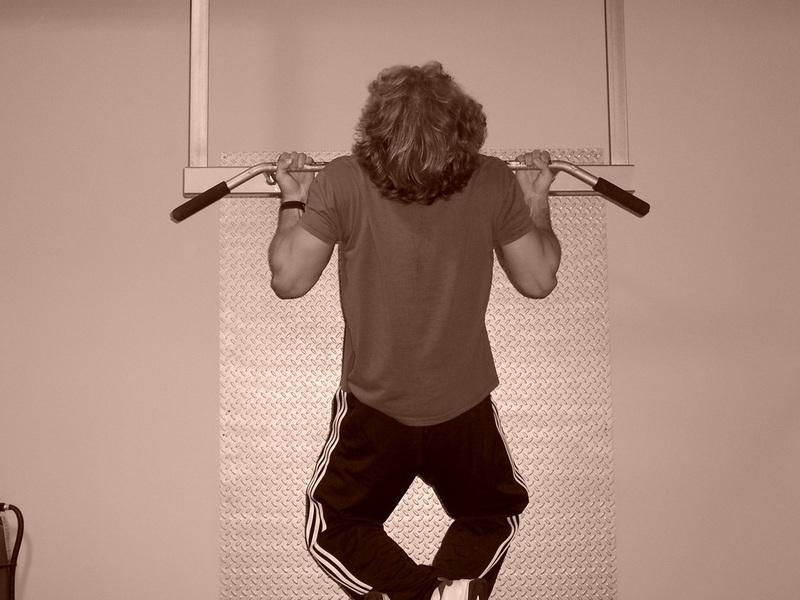 These can be performed on a regular chinning bar or on an assisted chin-up/dip machine. Almost everyone will have to start out on the assisted machine, as this is a very difficult exercise to perform with one's total bodyweight. The assisted machine will assist you in the amount that you select on the weight stack. You are not lifting this weight, this weight is counterbalancing your weight to assist you in lifting. For example: If you weigh 250 lbs. and you select 160 lbs. on the assisted chin-up machine, you are lifting 90 lbs of your own bodyweight (250lbs - 160lbs = 90lbs). Eventually, you can get strong enough to do these with your own bodyweight, or even with added weight. When you find that you can do more reps than is specified by your workout program with your own bodyweight, begin adding weight by holding a small dumbbell between your knees. Or you can use an exercise belt that is made to hold extra weight around your waist. This belt is usually called a Weighted Dip Belt and can be purchased online from many exercise equipment stores. 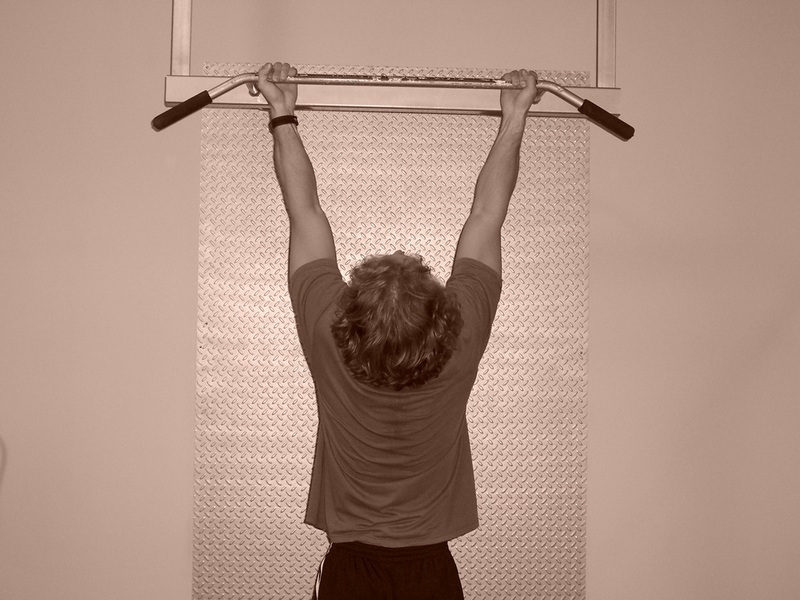 Hang from a straight chin-up bar with an underhand grip with your hands about 2-4 inches outside shoulder width. Once your grip is set, let yourself hang completely down for a full stretch of the arms and lats. Pull yourself up by pulling with your arms and lats (armpit/upper back muscles) and until your shoulders and elbows are pulled completely down and back and your lats are fully contracted as tightly as possible. The bar should end up at the collarbone level, but don't get overly focused on where the bar is. Think more about whether your lats are contracted as far down and back as they can possibly be. Once they are completely contracted down and back, let yourself back down under control for a full stretch all the way through the shoulders. Never allow yourself to kick, jerk, or swing on this exercise. It must be performed strictly. If you cannot perform it correctly, add more weight on the assisted chin-up machine to provide more assistance. If you cannot perform this exercise with your own bodyweight and you do not have access to an assisted chin-up/dip machine, simply replace this exercise with Pulldowns performed with a medium underhand grip. Also, although many assisted chin-up/dip machines provide up to 250 lbs. of assistance, we have seen some machines that only go up to 110 lbs. If your gym has a machine that does not provide enough assistance for you to complete the number of reps specified by your workout program with proper form, simply perform Pulldowns instead. There is a video below the following pictures which displays the proper technique for performing this exercise on the assisted chin-up/dip machine.